With a quaint style that will inspire warmth, beauty, and a timeless feel, our versatile Richmond Storage Bed is versatile enough to stand as the centerpiece of any bedroom suite. From the ground up, this handcrafted masterpiece offers a countryside Amish charm that is hard to beat. As you start to emerge yourself into the details of this bed, you'll notice a large, gracefully curved headboard that is complemented by the reverse curve of the footboard, creating a beautiful contrasting look to the piece. On each side, subtly splayed legs frame the classic slat design that is the main focal point of both ends. Below, a beautiful platform connects them both, adding stability to the piece while providing three drawers on each side, offering ample storage space for all of your bedding and bedside essentials. 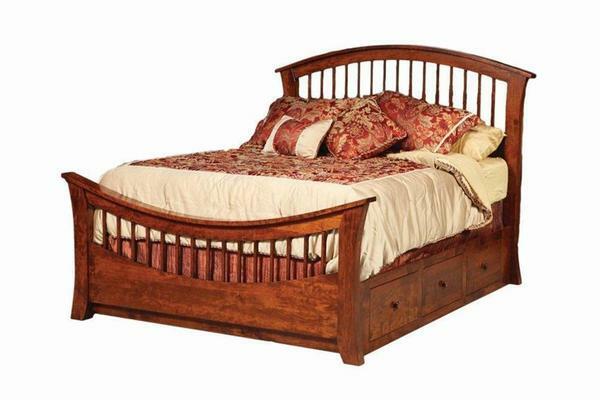 Put your spin on this classic bed by choosing from an array of sizes to fit any space - choose the wood that will match or complement your existing decor and finish it up with the perfect stain to bring out all the natural beauty of the grain patterns in the hardwood. The matte or semi-gloss varnish, whichever your prefer, is generously applied to hold in that beauty, and finished by hand to an heirloom quality that will leave future generations in awe of this beautiful bed. Footboard Height at Highest Point - 30 1/4"